A random walk is a mathematical formalization of a path that consists of a succession of random steps. For example, the path traced by a molecule as it travels in a liquid or a gas, the search path of a foraging animal, the price of a fluctuating stock and the financial status of a gambler can all be modeled as random walks. The term random walk was first introduced by Karl Pearson in 1905 but random walks have been used in many fields: ecology, economics, psychology, computer science, physics, chemistry, and biology. The definition of a random walk is dominated by a formula not by the act of walking, it exists mostly in the head not on a page let alone along a road. Alban Low and Harvey Wells give you the chance to put the random walk back on the map! 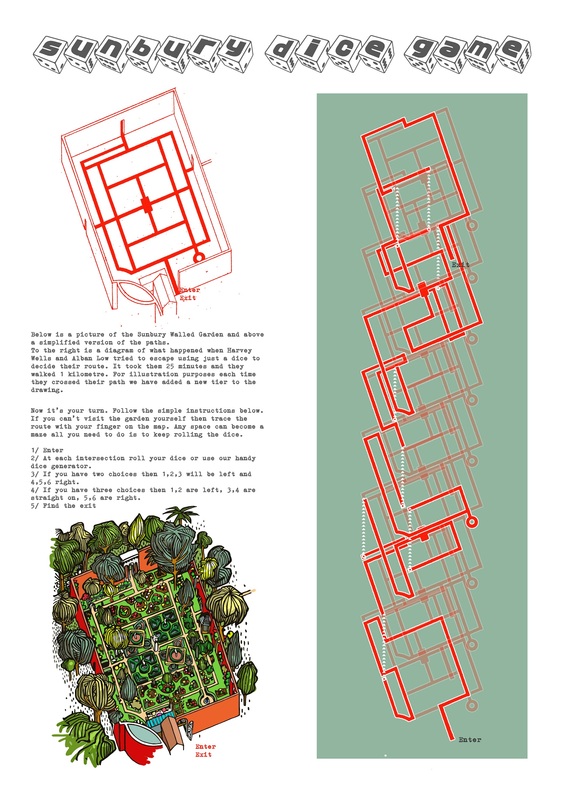 This map was inspired by The Dice Man novel published in 1971 by George Cockcroft under the pen name Luke Rhinehart. The book was based on Cockcroft’s own experiences of using dice to make decisions while studying psychology, the effect of this book and system used is one of subversivity and anti-psychiatry. The Sunbury Dice Walk is more of a repetitive adventure where the route becomes a maze. 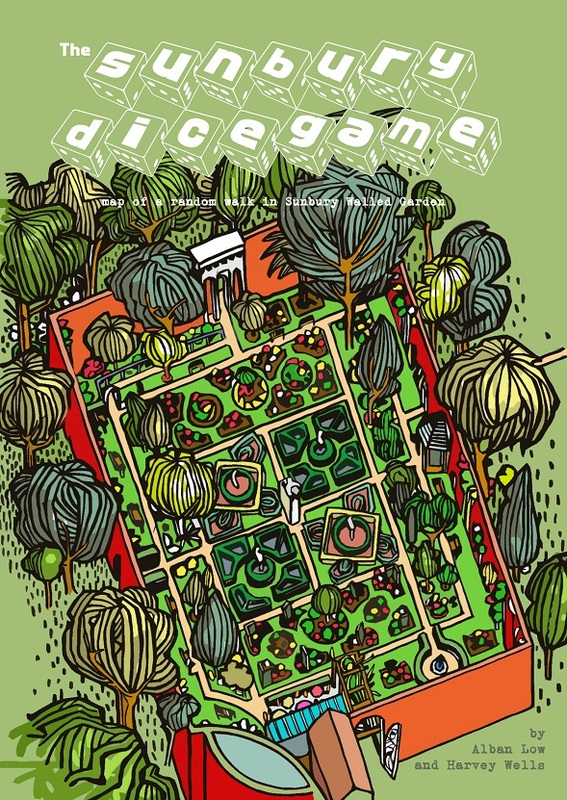 Alban and Harvey walked through the Sunbury Walled Garden armed just with a 6 sided dice to decide their route, their journey took 25 minutes in duration and 1km in length. In theory it could take you as little as 6 rolls of the dice to escape the Walled Garden or you could be stuck in there for infinity. Harvey Wells and Alban Low have been walking and exhibiting together for 5 years. They have created art walks in London (SMartwalks), Chorlton (Chorlton Arts Festival), Cambridge (Art:Language:Location), Bath (Fringe Arts Bath) and Exeter (NOSE Festival). They featured in the AirSpace gallery’s Walking Encyclopaedia in 2014. They have already created and published one map, the Cambridge Blue Plaque Walk (ISBN: 978-0953471287).